I have been meaning to sit down and put together Weston’s Birthday photos along with a bunch of other blog posts ..but wow May is an insane time for us… and its not even over yet! We have like 100 birthdays in May.. ok not 100… but including mothers day it’s 7! Also hoping this third baby of ours doesn’t make a surprise appearance in May and holds off until its due date in June! haha. However the great thing about all these May birthdays is all the great family time. Cousins running around on these gorgeous spring nights and wonderful meals shared together! Really we are so blessed to have such a big and beautiful blended family! The Day Weston was born is one of my fav days of the year, getting to celebrate that is always so fun yet emotional. It’s the reminder of becoming a mother for the first time and there is something truly so special about that! It is so hard to believe another year has passed by and that we are now the proud parents of a four year old!! We talked a lot about his party prior to his birthday and what he wanted to do, it changed daily for a while, but it kept going back to a dinosaur theme. Thank goodness he was ok with a dinosaur cake because at one point he wanted a woolly mammoth cake with octonauts and dinosaurs on top oh and prehistoric ocean creatures…LOL ! The weather ended up being fabulous and we were able to enjoy our backyard, and I believe it was the first time we have used our new deck for a big gathering. It was so cute he had told us who he wanted to invite and what kind of cake he wanted and he even helped pick out all the decorations. I think this kid has a love for party’s just like his mom and dad ! He absolutely has the biggest sweet tooth so since it was his birthday we did cupcakes and a cake, and of course he was thrilled!! I kept the birthday really simple this year and tried not to go over board, We had Doug’s work help make some food too which took the pressure off of us to prepare it all! The best part about this cake was how easy it was to make! A simple chocolate icing, some chocolate wafers for the palm trees, real ferns and leaves from our yard, and some small dinosaurs from the craft store and it was complete. As always I am unsure if my idea will actually come to life and look good, and well I was pleasantly surprised with the outcome! The look on Weston’s face when he saw his cake was priceless he loved it! I don’t think it would be possible to love him more ! Weston absolutely loves Uncle Johnny!! He is the best player and so much fun, Weston calls him his best bud, We probably should have paid John for all the running around he did with the kids at the party! So thankful for friends that are like family. We just did one activity for the kids- which was a fossil dig! I found the idea on pintrest. I went to Michaels Craft Store and bought a bunch of play fossils and buried them about 1-2 inches down and the kids ( and adults) enjoyed finding them.. somehow we are still missing one and Weston asks often if we can find it, we keep trying but no luck yet! I was surprised that this activity that was so simple to put together and in-expensive kept the kids occupied for a very long time!! We had a good chuckle at Levi digging, he had no idea that the kids were digging for fossils and he kept dumping dirt on himself, oh to be so little, love that he was just happy to be apart of the little group of kiddos. my beautiful mamma with my new nephew Theodore! Quite the little collection they had put together. Weston loved guessing what animal or prehistoric animal the fossils were, he had a very good track record for getting them right, best part was on the bottom of each fossil it said their name! Weston loved digging for the fossils and his best friend Eden loved cleaning them up with the brushes. I used some old makeup brushes that worked perfect for the activity! 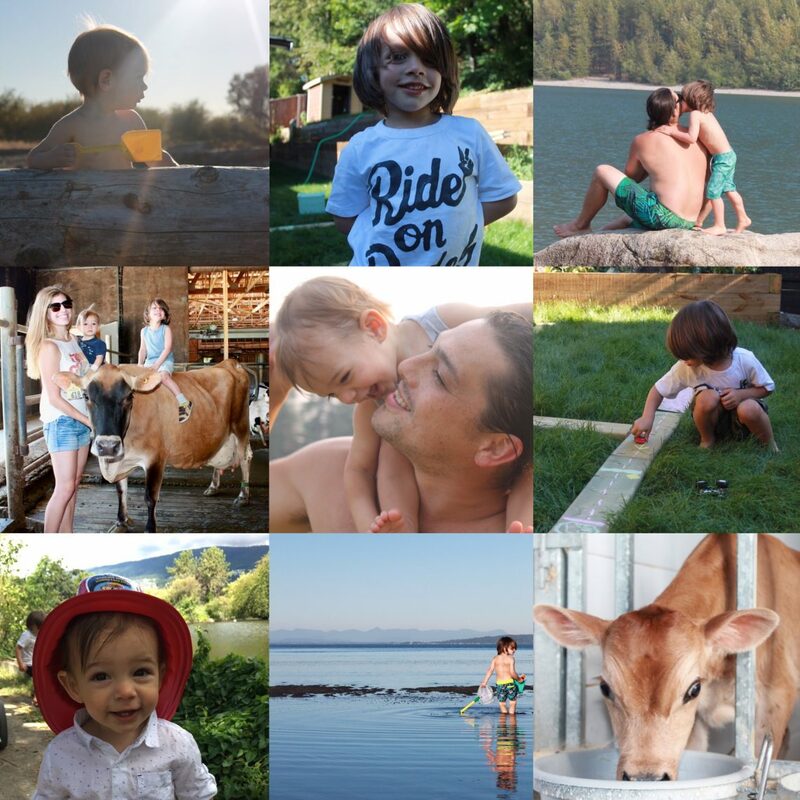 Thought I would share some of my favorite pictures from this past year as well as we have gone on so many big and little adventures and I am so lucky to be at home getting to spend each and everyday with these boys! The days can be long but its so true, the years are short. I love how we have just been embracing life with these littles, letting them be little and sleep in our bed when needed, letting them direct our days, spending our days digging for worms and looking for wood bugs, going for walks and having lots of down time especially right now with me being 37 weeks pregnant! Getting to look back on this past year and reflect on all the fun times we have had is such a great reminder of how great life really is right now. There are no easy days and time is not slowing down, but there are so many amazing moments and memories that when I look back I can’t help but feel so proud and grateful. To my sweet boy who is now four, we hope that your love for animals, nature and exploration keep expanding, and that you are always this curious and joyful! We couldn’t ask for a better child to be ours. We love you so much Weston ! Weston rocking his “tree frog glasses” The love Weston has for his little brother has grown so much! He always want to go down on the slide with Levi or play chasing games with him. I always dreamed of having my children be best buddies and it is really starting to show and that has been so amazing to watch! This age he is in right now is all sorts of fun, he is curious and independent and becoming really helpful. When I get to spend time with him one on one its really so special. Hearing and seeing his creations and listening to him talk about all sorts of animals and creatures is amazing. He is so smart, inquisitive and also becoming quite funny! A creature is a creature no matter how small ROAR!!! I believe he told me this was the biggest worm we have ever found and boy he was proud! Our little Cookie Monster ! He loves helping in the kitchen with baking and making smoothies. I truly cherish that time together ! Special thanks to Aunty Lisa for capturing so many great shots from Weston’s Birthday party! And thanks to our wonderful friends and family who helped us celebrate our boy! We love you !